Napkins have been recorded as being in use, from the times of ancient Roman Empire and prior to then, in ancient Greece. References to word napkin dates back to 1384 AD. It is believed that the first napkin was a lump of dough the Spartans called "apomagdalie." It was a mixture that was cut into small pieces, rolled and kneeded at the table, that led to using sliced bread to wipe the hands. In Roman antiquity, napkins known as "sudaria" and "mappae" were made in both small and large lengths. The sudarium, Latin for "handkerchief," was a pocket-size fabric earned to blot the brow during meals taken in the warm Mediterranean climate. The mappa was a larger cloth spread over the edge of the couch as protection from food taken in a reclining position. The fabric was also used to blot the lips. Each guest brought his own large mappa "napkin" and they became the first known "doggy bags" as guests leaving a Roman dinner had their mappa filled with leftover delicacies from the enormous feasts to take home. With the fall of Roman Empire, napkins disappeared from the dining table. The Last Supper by Dieric Bouts depicting the use of napkins. 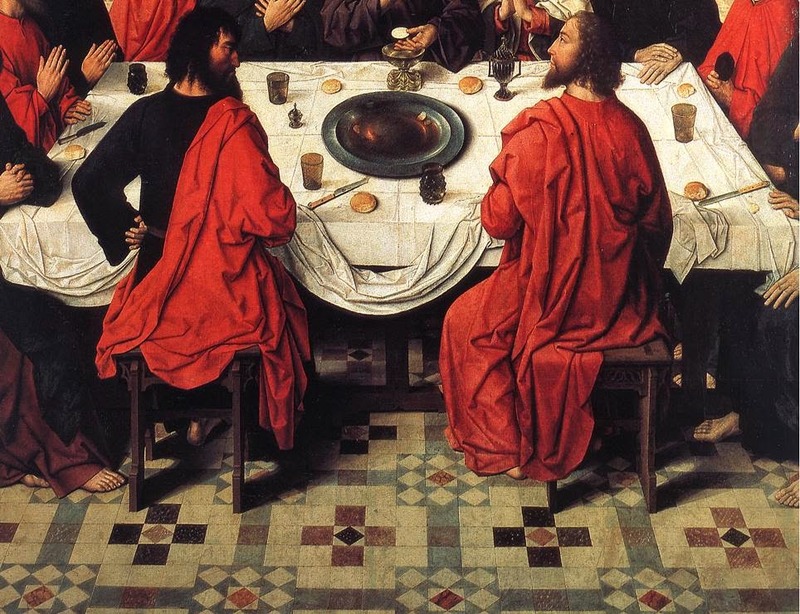 Napkins returned to adorn the dining table many centuries later and the classic painting Last Supper from 1464-1467 AD by Dieric Bouts depicts the use of napkins on the dinner table. The use of the napkin in Europe began in 1400 on the tables of royalty, where they started to use napkins made from warm or even perfumed cloth. By the 16th century, napkins were part of rich dining experience and came in many sizes, known by various names like diaper, serviette, touaille (towel) depending on the size and intended use. The art of napkin-folding in Europe began in Italy. The most popular, were those that were resembling animals. The folded napkins, or "serviettes", caught the eyes of all fashionable British, after the Restoration. Samuel Pepys wrote in 1669 in his diary, of a grand dinner held. The day prior, he wrote of having a caterer come to lay the table cloth and fold the napkins. 17th century saw the use of big sized napkins measuring 35" by 45" inches to help accommodate the needs of eating with bare hands instead of spoons and forks. 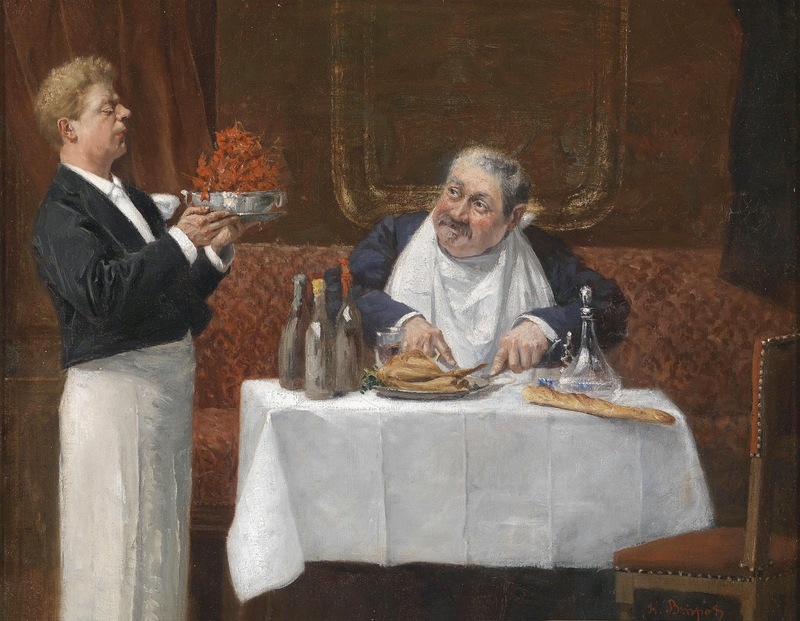 The size reduced when forks and spoons were accepted as part of regular dining experience in major parts of Europe in the 18th century including Great Britain. The 17th century also saw French come up with elaborate rules for nobility class which included instructions on napkin usage, a predecessor to modern day napkin etiquette, including the one which instructs the guests to not use the napkin for wiping the face or clean teeth or worse, rub one's nose. Napkin rings or "serviette holders" began in the Napoleonic period in Europe. 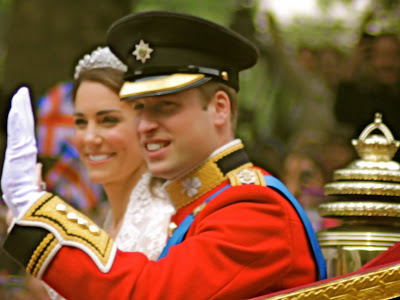 The rings were used mainly by upper class families as a way to identify which napkin belonged to what family member. At the beginning of the 1800s, napkins became part of the bourgeois lifestyle, mostly to protect the sumptuous dresses of the period during meals. The art really took off around 1880 with the incoming prosperity of the Industrial Revolution. One etiquette book advised "one should, if possible, avoid taking the bones into your mouth and when removing any, should shield your mouth with your napkin." 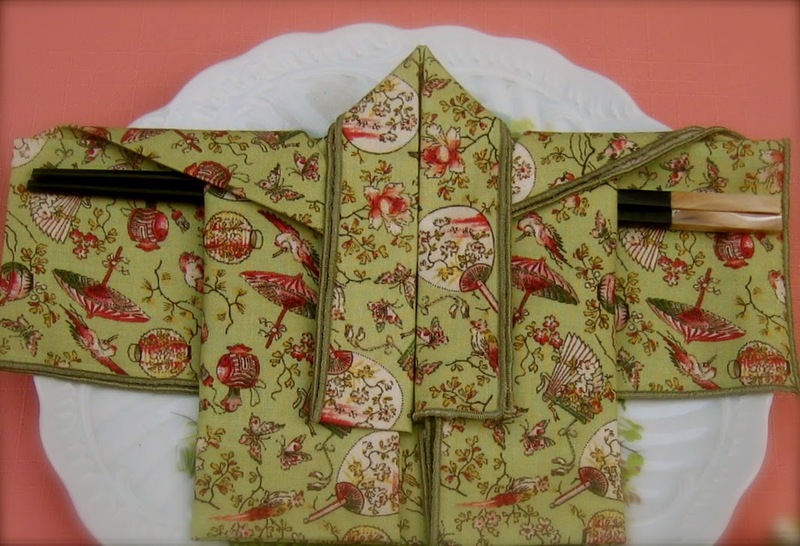 A napkin folded into a kimono with the chopsticks tucked in for the diner to pull out for use. 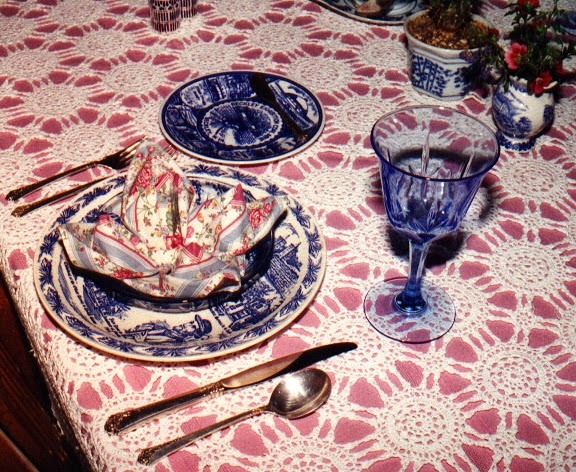 "Dinner over, the housemaid removes the plates and dishes on the tray, places the dirty knives and forks in the basket prepared for them, folds up the napkins in the ring which indicates by which member of the family it has been used, brushes off the crumbs on the hand-tray kept for the purpose, folds up the table-cloth in the folds already made, and places it in the linen-press to be smoothed out. “Finger-glasses are generally handed round as soon as the viands are removed, but they are intended merely to wet the fingers and around the mouth. When the finger-glasses are passed, wet your fingers in them and then wipe them upon your napkin. The habit of rinsing the mouth at table is a disgusting piece of indelicacy, which is never practiced by any well-bred person.Upon leaving the table, lay your napkin beside your plate, but do not fold it." “Napkin rings are discarded by many who hold that a napkin should be used but once, and must be re-laundried before reappearing on the table. Small fringed napkins of different colors are used with a dessert of fruits. Fancy doylies of fine linen embroidered with silk are sometimes brought in with the finger-bowls; but these are not for utility, the dinner napkin doing service, while the embroidered 'fancy,' a dainty bit of effect to the table decoration. Origami flower folded napkin in the plate for the first course. Paper napkins can be flimsy, so it is okay to use more than one. In a pinch, a paper towel can be used as a napkin. Napkins are never a part of your clothing so do not use your shirt sleeve or shirt tail to wipe your mouth with. Napkins can never be dipped in your water glass to then wipe your face with, once you are old enough to eat on your own. Tablecloths are no longer napkins. They were at one time in history, but that was very long ago. Your wrists and the backs of your hands are not napkins. A napkin stays on your lap the entire time you are seated to eat. If you have to leave the table for a moment and others are still eating, your napkin goes on your seat until you return. Napkins do not go back on to the table until everyone at the table is finished eating. Paper napkins can be crumpled and put on your plate when you are done, if the plate will be thrown away, as well. Cloth napkins go beside your plate, to the left. Unless you are part of the family, do not put your napkin back into a napkin ring unless you have been advised to do so by your host or hostess.